General Santos City--Labor and Employment Secretary Rosalinda Dimapilis-Baldoz yesterday expressed utmost confidence the 14th National PESO Congress, which opened here in a colorful note, will be productive and achieve its goal of preparing the country's network of PESOs for the opportunities and challenges of the ASEAN integration. 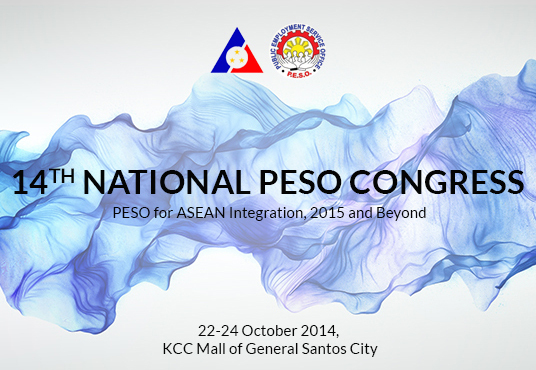 The 14th National PESO Congress, with the theme, PESO for the ASEAN Integration, 2015 and Beyond, is being held at the KCC Mall Convention & Event Center in this city and will run until 24 October. "I have seen the program and line-up of activities of the Congress, and I am very much hopeful the discussions will lead to concrete commitments among all the country's PESO managers on what will be their next steps to achieve our goals of decent and productive work through effective and efficient employment facilitation. The 14th National PESO Congress opened yesterday with a plenary assembly following the arrival of regional delegates, PESO Managers Association of the Philippines (PESOMAP) National Officers, resource speakers, and guests, including the media. The Choir Division of the General Santos City Government Employees Performing Arts Co. performed at the opening ceremonies, with ecumenical prayers recited by Muslim elder Jahal Addat, the Rev. Dionesio Talon, and the Rev. Andres Docena, Jr.
Ms. Vissia Marie P. Aldon, PESOMAP, Inc. President, formally opened the Congress, followed by a video of PESO milestones, entitled, Facilitating Decent Jobs Towards ASEAN Integration and Beyond. General Santos City Mayor Ronnel Rivera welcomed the participants and delegates to the Congress. Baldoz said she is impressed by the line-up of topics for discussion in the Congress. Among the resource persons who will make presentation are Asst. Secretary Ceferino S. Rodolfo of the Department of Trade and Industry, who will speak on the Impacts of ASEAN Integration to Investment and Services; Executive Director Marissa G. Legaspi of the Technical Education and Skills Development Authority, who will speak on the Role of PESO in the Mobility of Skilled Workers in the ASEAN Region; and Luis Alberto Anastacio, President and Chief Operating Officer of the SFI Group of Companies, who will inform the Congress on the SFI Group and DOLE partnership to develop a nationwide talent map. His talk is themed, Nationwide Talent Mapping Initiative: Aligning the Filipino Workforce for the ASEAN Integration. Tomorrow, the plenary discussions will continue with National Economic Development Authority Deputy Director General Emmanuel F. Esguerra delivering a presentation on the Key Role of PESOs in ASEAN Integration. Following him will be BLE Director Director Dominique R. Tutay who, together with John Kim, Chief Executive Officer of the The Now Group, Inc. and Rhea Suiza, Sales and Marketing Manager of Quantum X, Inc. will explain the Enhanced PhilJobNet for Efficient Job Search and Improved Skills Matching. Finally, Aurelio L. Ebita, DOLE Regional Office No. XII SPES Consultant, will talk about the Online SPES, and Billy Cruz, Operations Manager of the Career Hub Network will discuss The Growth and Opportunities in the BPO Industry and BPO Career Hub's Virtual Solutions. Local chief executives led by Mayor Marlyn B. Alonte-Naguiat, of the City of Biñan, Laguna; Mayor Allan R. Rellon of Tagum City, Davao del Norte; and Vice Governor Ramon G. Lacbain II of the Province of Zambales will regale the Congress with their presentations of LCE's LCEs’ Good Practices in PESO Institutionalization. There will also be testimonials of success from SPES beneficiaries, lead by Merry Gen Oyog-Cafiño of Tacurong City; Rolly O. Manzon of Koronadal City; Ker Barsalote of Sarangani; Melanie R. Abella of Kidapawan; and Rusty Villo of Lebak, Sultan Kudarat. Statements of support are expected to be delivered by Rep. Emmanuel “Manny” D. Pacquiao and Gov. Datu Suharto Mangudadatu Governor Province of Sultan Kudarat. Rep. Karlo Alexei Nograles, Chairman of the House Committee on Labor and Employment and Sen. Juan Edgardo "Sonny" Angara, Chairman of Senate Committee on Labor and Employment and Human Resource Development are the special guests of the 14th National PESO Congress.